I love all children’s books, but I tend to be a little overly enthusiastic about middle grade books. “What are your favorite middle grade books?” I’ll ask the woman I just met on the subway who is sitting next to my daughter and commenting on how much she likes my daughter’s shoes. For those of you who might be a little confused about what falls into the category of middle grade books, here’s a quick little primer in twenty-five words: The target age group is generally eight to twelve (sometimes nine to thirteen), and famous middle grade books include Harry Potter, Charlotte’s Web, and Matilda. 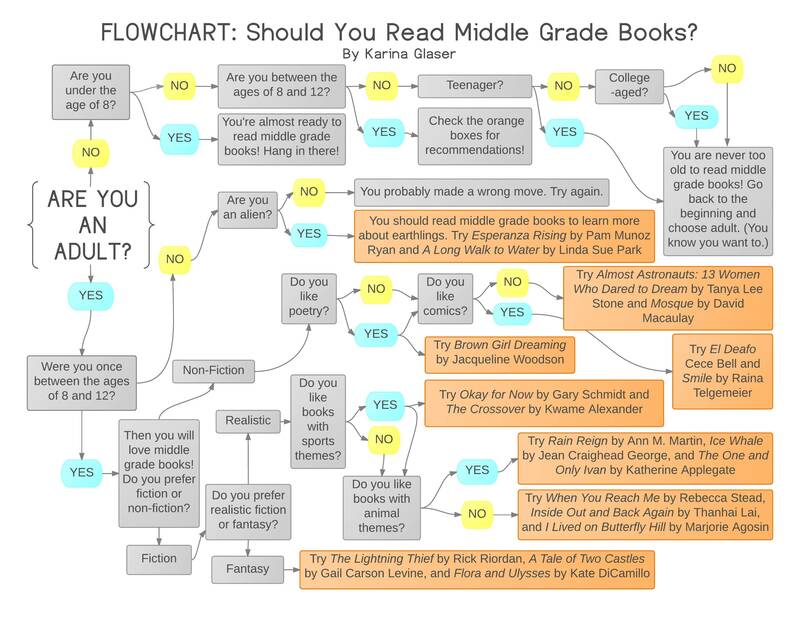 Should you be reading middle grade books? What if you’re not between the ages of eight and twelve? Check out this flowchart to see. Do you have a favorite middle grade book? Please share!